EDDIE Laure still looked in fine form when he played in a goodwill tournament last week, but don't expect him to return to competitive basketball. The PBA veteran played for the University of Santo Tomas squad that took the title in the UAAP Goodwill Games, tournament for the league’s staff, officials, statisticians and mediamen. But he made it clear his focus these days is no longer on playing but on coaching. Although players his age are able to maintain roster spots in the PBA, the former MBA MVP is no longer inclined to compete for a place in the pro league, choosing to concentrate on his job as an assistant coach of the UST women’s basketball team. “Tama na sa akin ’yung mga ganitong papawis. At least, masaya, nadagdagan ’yung mga tunay na kaibigan mo,” said Laure, 39, when SPIN.ph caught up with him. “Sa akin kasi, tama na,” he added. Laure last played for Mahindra in the PBA's 2015-2016 season, a year after he was picked by Blackwater during the expansion draft in 2014. Away from the PBA, the former Adamson forward keeps himself busy with his coaching duties with UST, which fell a win short of the Final Four, losing to Adamson in a playoff for the fourth spot. It is Laure’s first coaching job, and he is pleased to be working at the same school where his daughters EJ and Eya plays in the women’s and high school girls’ volleyball squad, respectively. Laure admitted the job isn't easy, but he actually likes the new challenge. “Nagpapasalamat ako kasi na-tetest talaga ’yung pasensya ko sa sarili ko. Hindi kagaya kapag player ka, practice ka lang, laro ka lang. Pero as coach, mapapaisip ka. Kahit sa gabi, mag-aaral ka,” said Laure. Laure knows where his priorities are right now. 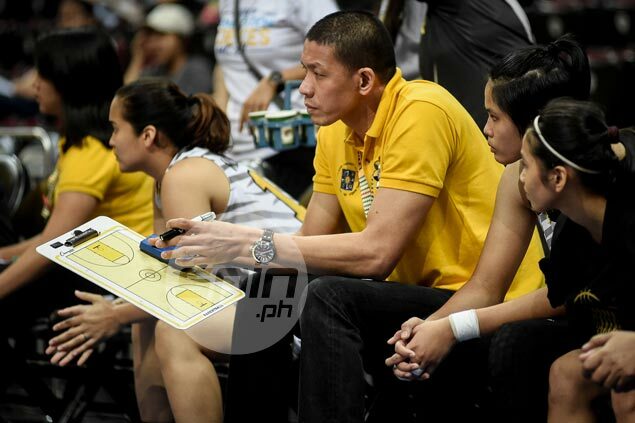 “Sa coaching na ako at sa pag-aaral ng coaching ako magfo-focus,” he added.